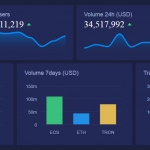 A node is any computer that connects to the blockchain network, for instance, any computer connected to the Bitcoin network can be regarded as a Bitcoin node. A full node is a node that fully enforces all of the rules of the blockchain, while a light client (also known as lightweight node) is referencing a trusted full node’s copy of the blockchain. This means that you can transact on the blockchain without downloading an entire copy of the blockchain. It’s important to note that this is no small file because the entire history of blockchain must be downloaded. There are currently 9560 bitcoin nodes across the globe, according to earn.com. Even though there are 109 different countries that host at least one bitcoin node, majority of them are located in only three countries. As you might expect, first on the list is USA with 2380 nodes or 24.9% ahead of Germany with 1912 or 20%. Third place on this list is occupied by France with a steep drop in overall nodes numbers – France has “only” 612 nodes or 6.45%. Summed up, these three countries are holding over 50% of bitcoin full nodes in the network. Perhaps even more interesting though, is Singapore and the Netherlands’ notable presence on this list. Both fairly small countries represent the greatest density of Bitcoin nodes per capita. With 17,700 and 32,000 citizens per node respectively. 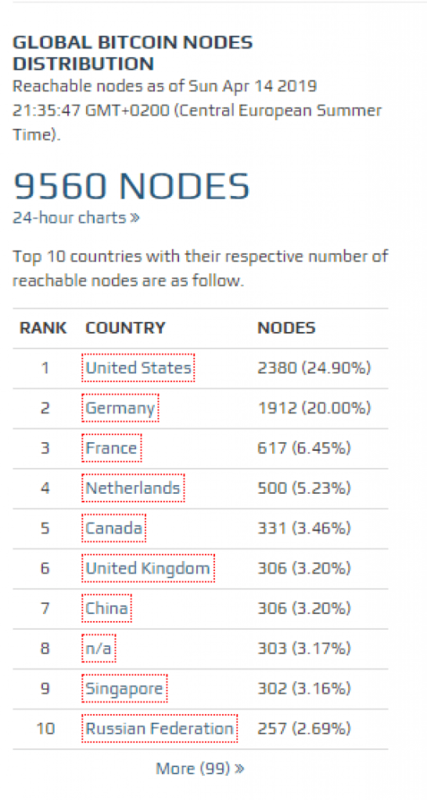 For context, the US has over 120,000 people per node.